This hand-forged beauty features a massive 26-1/2" carbon steel blade that has been hand sharpened. It features a blood groove for authenticity and a custom zinc alloy tsuba with a corresponding pommel for some designer flare. The handle is completed by ray skin and a bright red cord wrap that gives this Samurai wonder an imperial look and feel. It comes to you with a matching red lacquered scabbard. 41" overall. Absolutely gorgeous! Both the sword and scabbard are works of art. Battle ready. For this price, this is a steal. Get one! Thanks BudK! I'm not sure what drew me to order this Katana, because neither the color nor the style was exactly something that I'd typically look twice at, but somehow I kept finding myself coming back to it and decided to place the order, if for no other reason than to satisfy my nagging curiosity about it. Upon delivery, I wasn't disappointed at all! This sword may seem simple in it's design but it's top notch as far as quality, sharpness, thickness, weight & balance and overall 'feel' when held. Easily this has become one of my favorite swords for Tameshigiri & daily practice. And there's a certain Shibumi-like elegance to it in it's simplistic appearance. 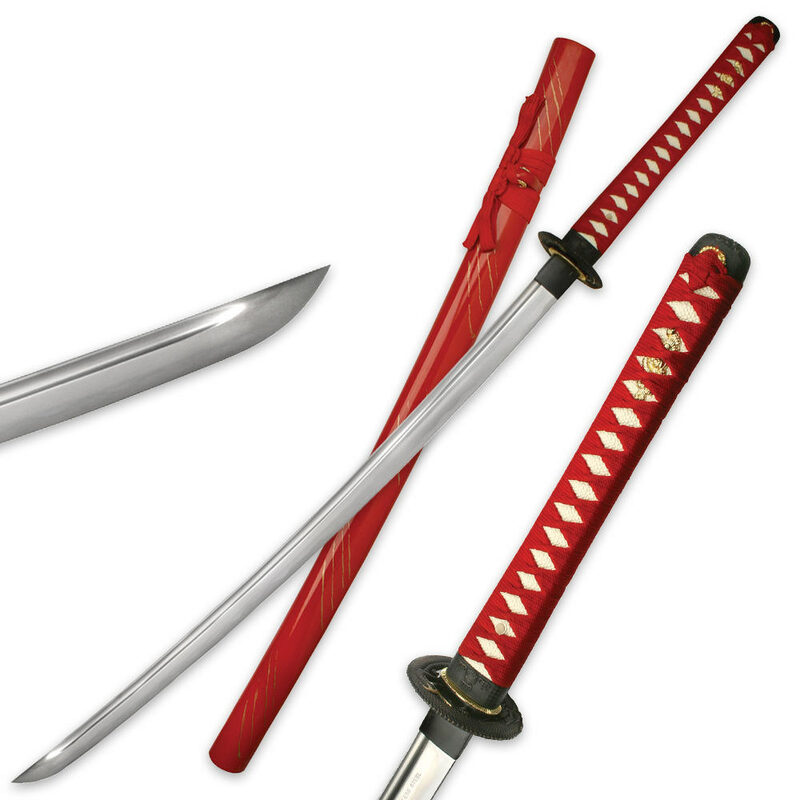 As others have noted, you won't be let down with this sword, whether you're a beginner to Japanese Swords, or a long time aficionado for all things Samurai. For the price this is very high quality and sharp right out of the scabbard, nicely polished and well done in all aspects. You won't be dissapointed with this one. My frist sword and i was very impressed. I received it in only 3 days. The sword itself is in excellent conditionthe very sharp and very good weight to it. The case had one small paint chip on the bottom but other then that it was perfect. I would recommend this sword to anyone. I will be makeing more purchases from here in the future. Unbelievable sword for the price. I was totally speechless when I unboxed this sword. The quality and craftsmanship is near perfect. I thought for a moment they sent me a more expensive sword by mistake. Sword comes sharp. Fittings are tight. I expected problems because I usually don't buy swords this cheap but I couldn't find any. Go out and get this sword. We'll worth the money and then some.